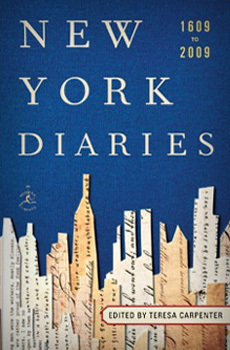 NYPL Notes: Court of first model tenement house in New York, 72nd Street and First Avenue, Manhattan.. Source: Changing New York. : The New York Public Library. Photography Collection, Miriam and Ira D. Wallach Division of Art, Prints and Photographs. John Wanamakers’s, Fourth Avenue and 9th Street, Manhattan. March 6, 1936. 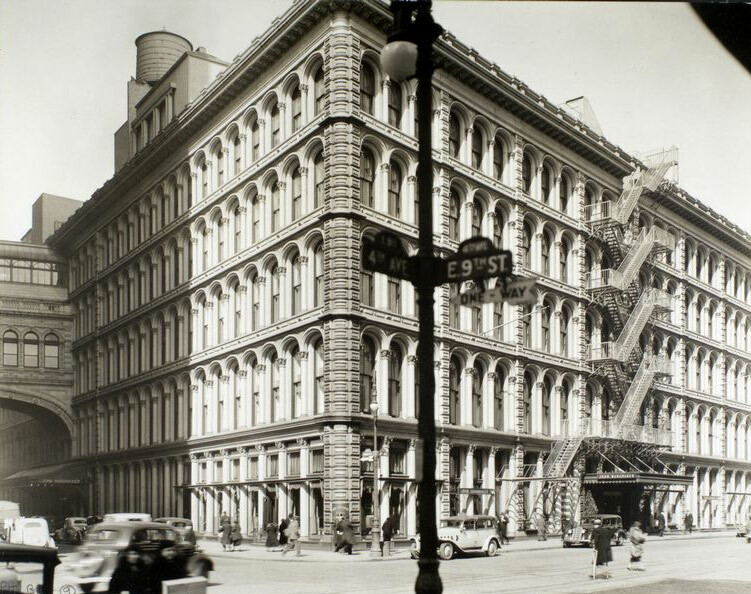 NYPL Notes: Looking at iron-front store originally built by A.T. Stewart from across4th Ave.; bridge connecting with annex at left, traffic, pedestrians. 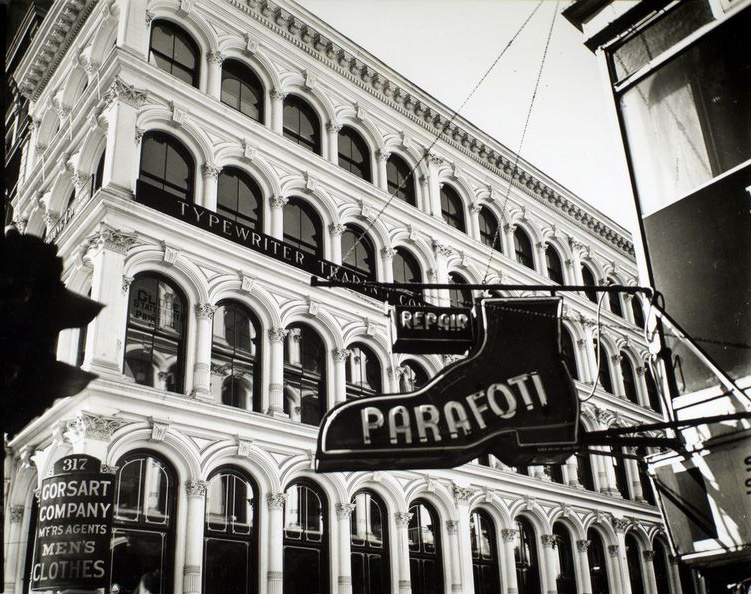 NYPL Notes: Sign for shoe-repairs and traffic signal partially block view of facade of arched windows. Source: Changing New York. : The New York Public Library. Photography Collection, Miriam and Ira D. Wallach Division of Art, Prints and Photographs. Broadway and Thomas Street, Manhattan. March 6, 1936. 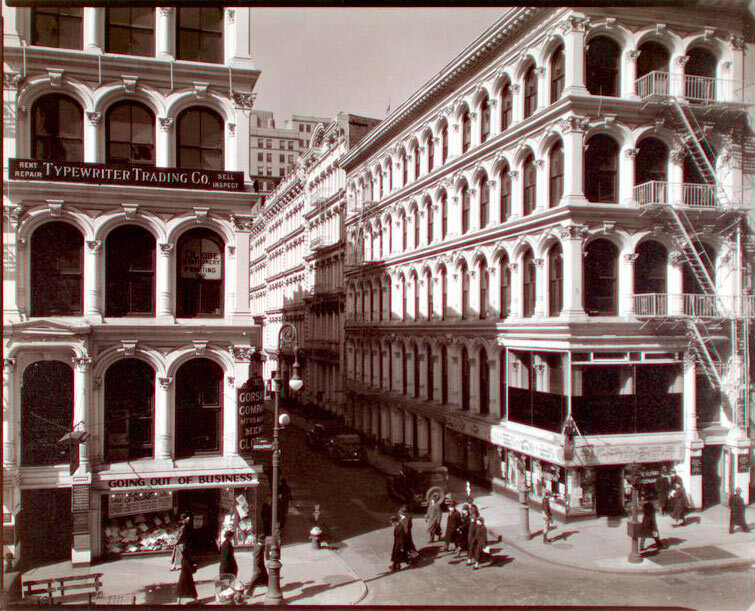 NYPL Notes: : Looking into Thomas Street from a building across Broadway, white arched facades on both sides of Thomas, signs for men’s clothing store, Source: Changing New York. : The New York Public Library. 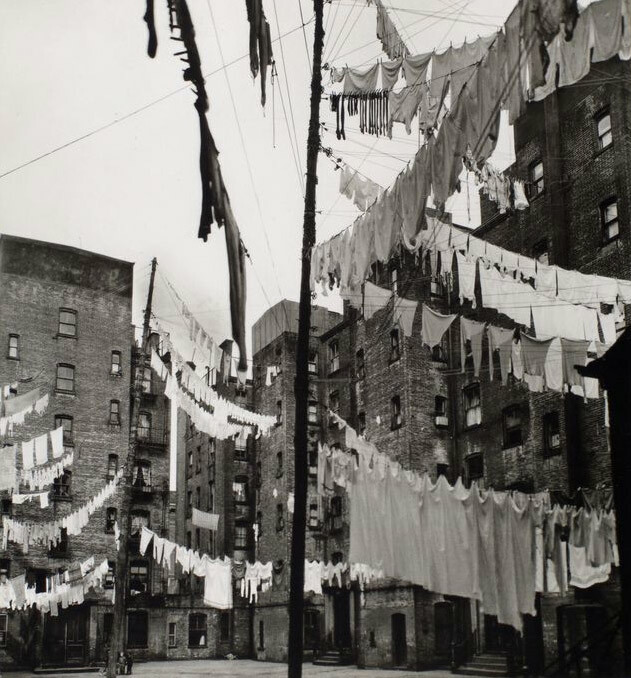 Photography Collection, Miriam and Ira D. Wallach Division of Art, Prints and Photographs. Columbus Circle, Manhattan. February 10, 1938. 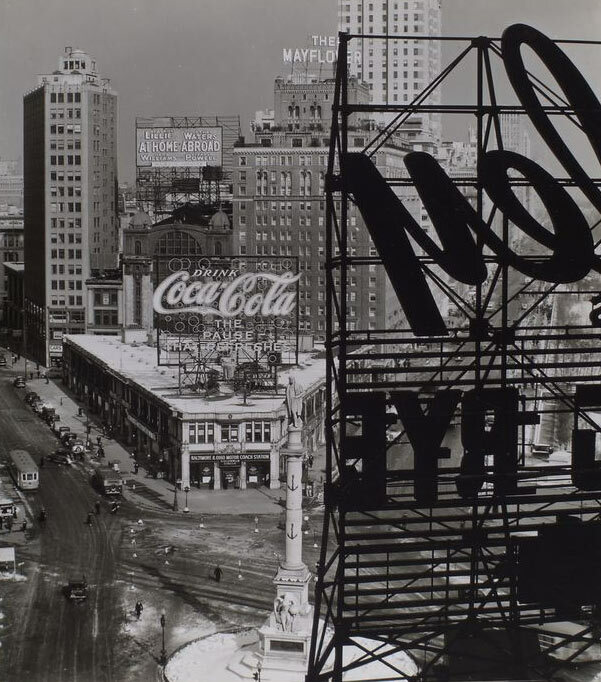 NYPL Notes: Looking Northwest from above the circle, statue of Columbus, B&O bus station topped with Coca-Cola sign, other signs, Central Parkwith snow. Changing New York. : The New York Public Library. Photography Collection, Miriam and Ira D. Wallach Division of Art, Prints and Photographs. Rope store, South Street and James Slip, Manhattan. February 05, 1936. 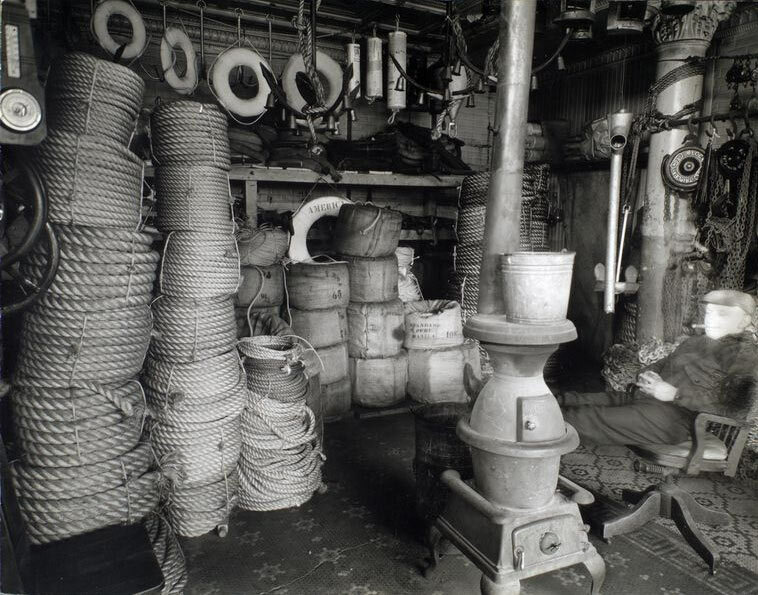 NYPL Notes: Man relaxes with cigar near pot-bellied stove, coils of ropes, life rings and other materials stacked and hung around the room. Source: Changing New York. : The New York Public Library. Photography Collection, Miriam and Ira D. Wallach Division of Art, Prints and Photographs. 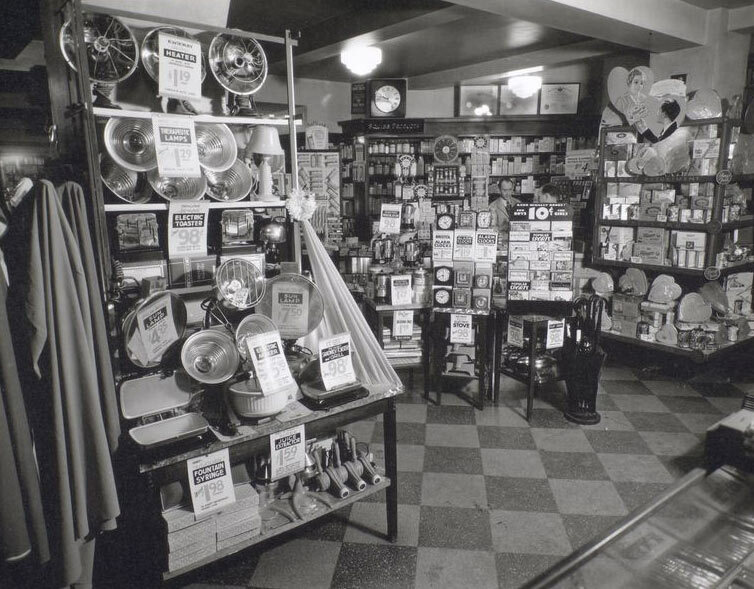 Whelan’s Drug Store, 44th Street and Eighth Avenue, Manhattan. February 10, 1936. 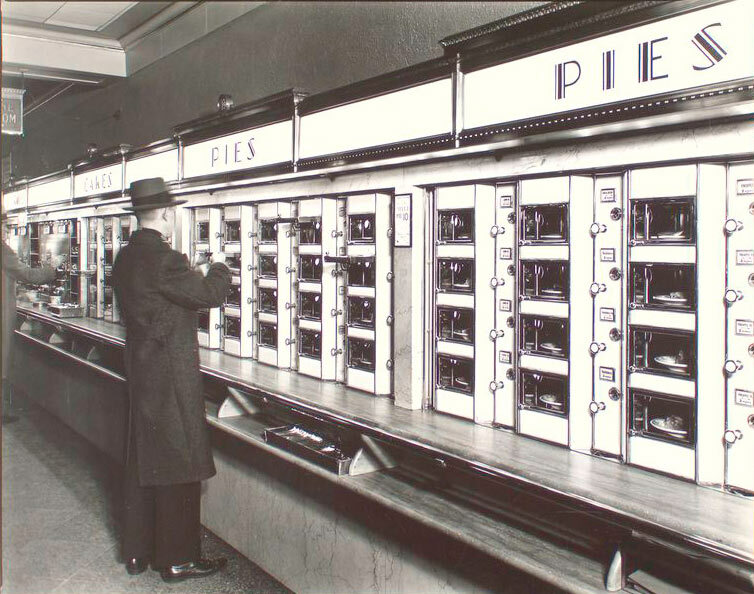 NYPL Notes: Man waits on customer in background, displays of electrical appliances, clocks, and a Valentine’s Day display of candy. Source: Changing New York. : The New York Public Library. Photography Collection, Miriam and Ira D. Wallach Division of Art, Prints and Photographs. 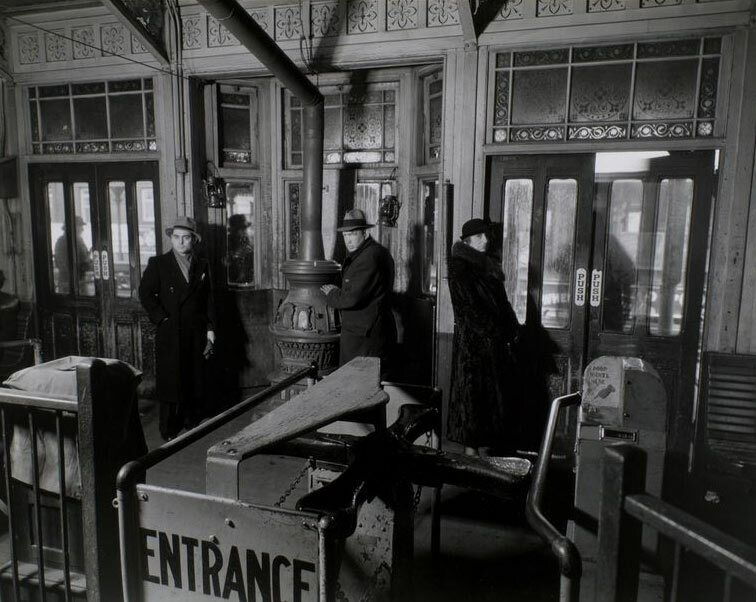 NYPL Notes: Men gather near stove, woman waits by door, turnstiles in foreground inside ‘el’ station with etched glass, carved wood details. Source: Changing New York. : The New York Public Library. Photography Collection, Miriam and Ira D. Wallach Division of Art, Prints and Photographs. 40th Street between Sixth and Seventh Avenue, looking southwest. December 05, 1935. 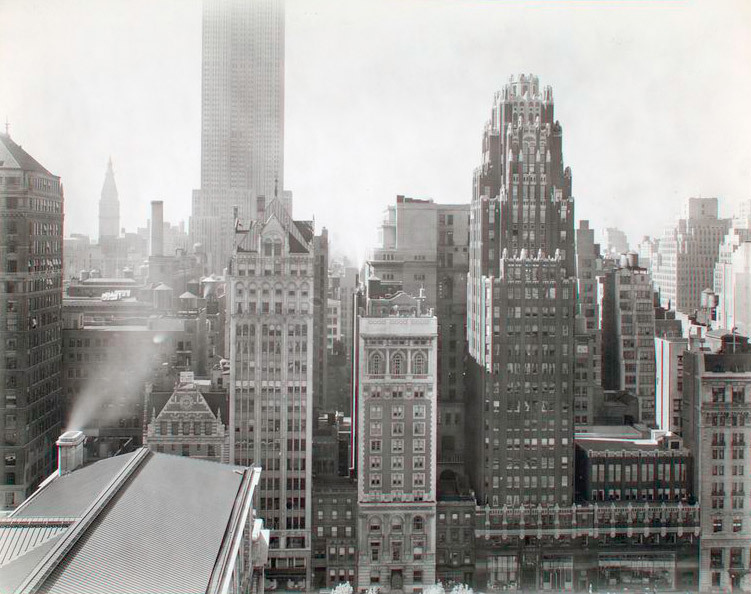 NYPL Notes: Bryant Park Studios at left and Union Dime Bank, right, in foreground, large office buildings in garment district, beyond.. Source: Changing New York. : The New York Public Library. Photography Collection, Miriam and Ira D. Wallach Division of Art, Prints and Photographs.